Whose autograph do you have? Discussion in 'Henson People' started by travellingpat, Feb 15, 2006. I have Brian Henson's Autograph on my Canon XLs Caera housing - Along with Kevin Smith... But I wouldn't consider Jason Mewes a muppet although he acts like one. I have the following autographs from when I attended the UK premiere and after party of Muppet Tresure Island in 1996. 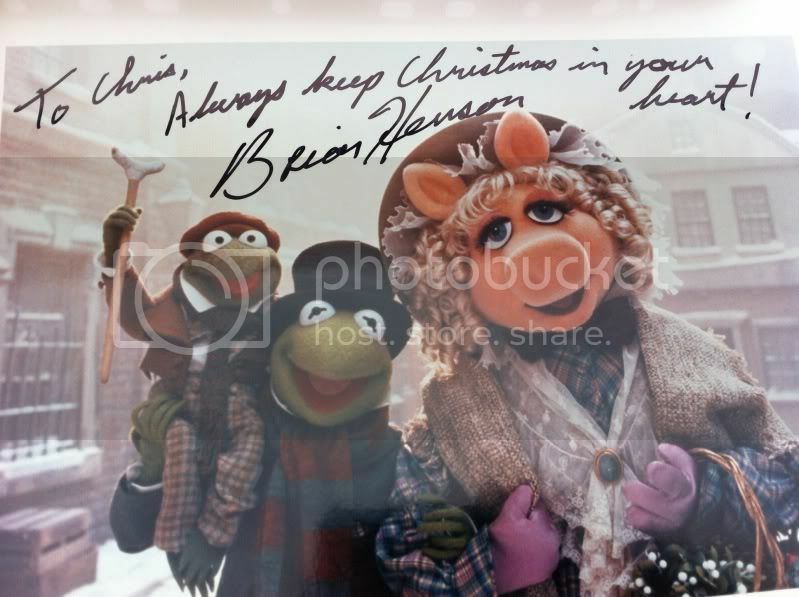 To Chris, ''Thanks for being the Muppets biggest fan'' Brian Henson. Hans Zimmer ( The Music Composer for MTI and Lion King). a signed 8x10 of Jim Henson and The muppets. Signed Index Card ''Many Thanks, Jim Henson and a hand drawn picture of Kermit. Photo of Brian Henson signing my MTI book. Frank Oz signing my MTI book. Dave Goelz signing my MTI book. Me and the original 1976 Fozzie Bear puppet! Great thread and very interesting to see what people have. Man, you are so lucky!!!!! That party sounds like a blast!!!! I'm so jealous!!! Well, I have Jamie Coutier's (creative supervisor, The Creature Shop - before it closed) and Matt Bacon's autographs having picked up a copy of Matt's No Strings Attached when it was first published. I have Cheryl Henson's and Kevin Clash's too. Well, the sad thing is, my sister and I USED to have autographs from Sesame Street characters, but they're long gone. We wrote letters and got replies from Carroll Spinney with two 8x10 Big Bird photos and also got Bert and Ernie 8x10s signed by Jim Henson and Frank Oz. I can't remember if they were personalized or pre-signed photos, but all I know is we no longer have them. Jim Henson & Frank Oz autograph on the LP record "Born to add"
Jerry Juhl autograph on the program from november 2004 Tribeca film festival (Jim Henson celebration) & me with him on a photo. Also LOTS of their Muppets autographs are all over the place... Even one from Gramps and Slim from the Jugband! I know I'm bumping a really old thread, but could you tell us all of the Muppet Autographs you have? Or maybe post some pictures? Please? I would really like to see what the Muppets' autographs from the 70's look like. I have an "Art of the Muppets" Poster autographed by Jane Henson, and a person note to me "Muppet Molly". I did meet her and Heather. I am hopefully working on Steve Whitmire's after I get this birthday card sent out to him that is obviously not gonna be there on his real birthday which is...tomorrow but better late then never. I'm more about getting photos with the performers these days rather than getting autographs, but out of the Muppet performers who's autographs I DO have: Steve Whitmire's, Carroll Spinney's, Jane Henson, Cheryl Henson, Kevin Clash, Jerry Nelson and my personal achievement: Frank Oz's seen in my avatar! But I've met most of the key performers at this point but I've gotten photos with them. I'm about half and half (photos vs autographs), although it's probably leaning more towards autographs these days. I think circumstances sometimes dictate that. But there are times where I'll just bring a camera and not consider trying to get them to sign anything. One photo that I really just lucked into is of Jane Henson in front of Jim's star on the Hollywood Walk of Fame. 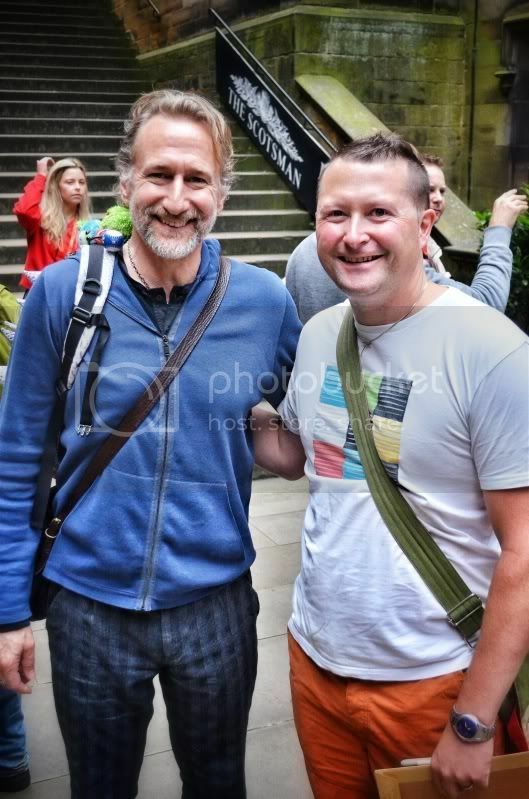 Congratulations, Chris, on meeting Brian Henson! Where did you see him? I've met him twice now, once at a live performance of Stuffed and Unstrung (aka Puppet Up!) and once at a taping for Celebrity Apprentice. He was very nice about taking a pic with me as well. Met him at puppet up too. It's here in the UK right now, I'm seeing the final performance in 3 hours!! Brian was very happy to sign my picture and have a photo taken with me. I also met him before in 1996! LaniArianna, Muppet fan 123 and MelissaY1 like this. Man, I'm reading all these posts feeling mega jealous! I sent a letter off to Steve Whitmire a few months ago, but I highly doubt I'll get anything back. The only way I'll ever get an autograph is if I fly to America and hunt them down. Can anybody PM me with a reliable address other than the Sesame Workshop one. I'd really appreciate it! Yeah Brian's really nice to the fans. Did you enjoy Puppet Up? I LOVED the show when I saw it. I hope they bring it back to NYC again soon. Guys, I hate to burst your bubbles, but there really are no more reliable address out there for the Muppet performers. Your best bet would be the Sesame Workshop address, or the address of the location of the next Muppet movie (after Muppets Most Wanted). I'm sorry, but I haven't seen ANYONE get ANYTHING back from ANY address since early 2011, where someone sent Jerry Nelson a letter and a couple of pictures at the Sesame Workshop address, and received the pictures signed six months later. If anyone EVER finds a reliable address, please share it here. Not true. I sent a letter to Carrol Spinney at a Sesame address and got two awesome signed pictures from Big Bird and Oscar from him nearly a month later.